eD@HoMe: 2 Awesome covers from Europe! Thank Goodness it's the weekend! After a long, hectic work week, I'm looking forward to just sitting back and enjoying my stamps over this long weekend (Monday is Singapore's 44th Birthday!). As for now, I have 2 nice covers to share with you. 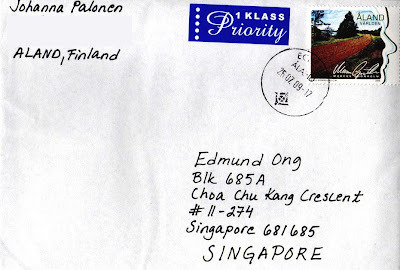 The first cover was sent from Àland, Finland. Many thanks to Johanna Palonen! 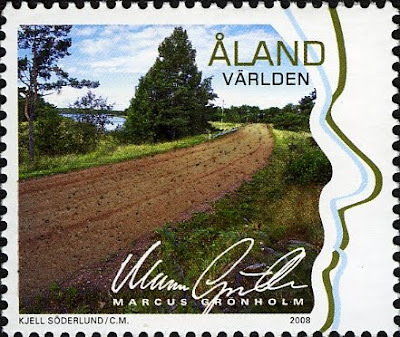 The lovely stamp franked on this cover was designed by ex-Rally driver, Marcus Grònholm in 2008. Entitled "My Àland", it is a series of Àland stamps giving well-known personalities with a connection to Aland the possibility to express their personal view of Aland. Marcus Grònholm started his rally career in 1987. His performance in the Finland Rally 1998 was unbelievable; he got his big breakthrough at the age of 31, which led also to a contract with Peugeot. Marcus won his first world championship in 2000 and achieved the same feat again in 2002. In 2007, however, he decided to end his rally career. Marcus has visited Àland on a number of occasions, mostly with his family during the summer time. He has many fond memories of Àland but, as a rally driver, he likes to focus on the red asphalt and the red gravel roads. "The roads were really what struck me most here in Àland. They made quite an impression on me and I also enjoy driving on them", Marcus said. A clear connection to Àland is also Marcus' mental and physical trainer Christoph Treier, originally from Switzerland. He used to live in Àland and Marcus liked to pay him a visit. The stamp illustrates a sinuous red gravel road, a common sight for those who drive along the bypaths in Àland. In the right margin, we see the contour of Marcus-Grònholm's and Christoph Treier's profiles in green and light blue. An unique feature of this stamp is the tangible gravel surfacing. Authentic Àland red granite has been burnt right onto the stamp! Next, we have this awesome cover sent by Jerome from France. Merci! 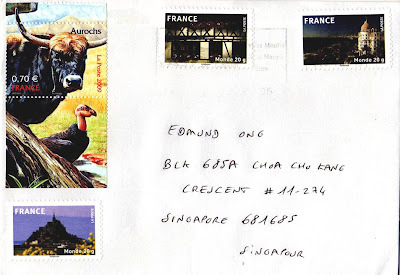 The stamp franked on the top left corner belongs to the "Endangered Animals" series, issued in 2009. 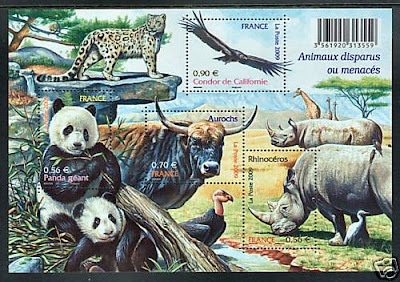 Species shown in this set are the giant panda, the aurochs, the rhinoceros, and the California condor. 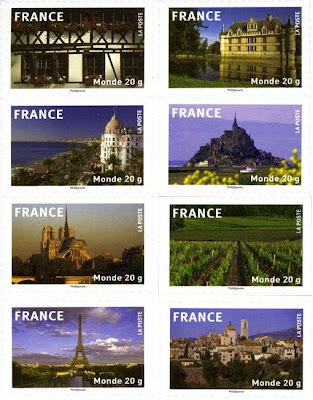 While the other 3 stamps are from the "Images of France" series, issued on 14th May 2009. Well! That's all folks! Have a great weekend! I can't see clearly the cancelation on my cover but it seems a unusual one. 3 stamps are not canceled and the one canceled is with a rectangular cancelation, which are not used anymore except for particular events. Hi Jerome, 2 of the stamps were cancelled. One with a rectangular cancel and the right stamp with a circle cancel. I always wondered what those green and blue lines depicted :o)...Live and learn! Thanks!